My friend Emily from Seattle with Kazuhiro and his wife. Emily has the best smile on campus. In fact, she should be in those toothpaste commercials. (I´m not kidding) With her optimistic, bubbly personality, sense of humor, and natural beauty, it is no surprise that many of the guys on campus drool over Emily. Only thing though, she´s totally oblivious of her impact on men. Kazuhiro is a trip. He´s a very smart guy who loves to party. There is never a dull moment with him. His blond hair shows the festive part of his personality. 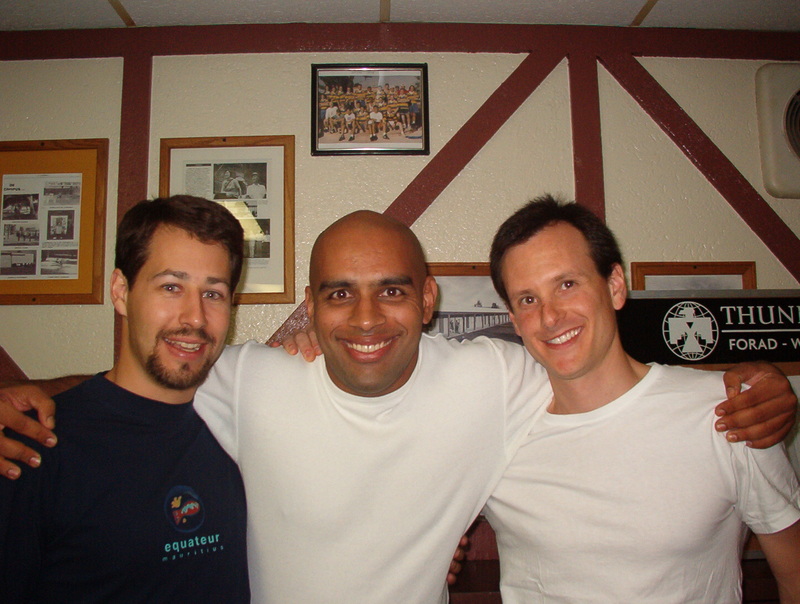 Hanging with my buddies Nicholas from Austria (left) and Marcel from Brazil (right). If there is anything these guys could not be accused of, it would be not knowing how to party nor not being adventurous. One time Nicholas went skydiving without telling his girlfriend only to send her a postcard picture of him jumping off the plane. As soon as she received the postcard, he called her on the phone to see her reaction. If I didn´t know better, I´d say Nicholas is like a little kid, testing his girlfriend to see how much he can get away with. It´s a good thing that Nicholas´ has Nikola, his girlfriend, to keep him in line. My hope for Marcel is that he will have great girlfriend like Nikola who who also keep in check.